How Angie J came across this I'm not sure. It's on a Wrigley's Extra display so I assume it's some unidentified country's way of shortening the word Spearmint. Doesn't really work in English though, does it? 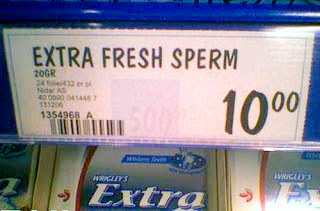 I wouldn't fancy chewing on that, even if it is extra fresh. Surely it comes in 10cc portions.